Brigid Clingman, OP and Dominican Associates Carol Nugent and Gloria Switzer carry a banner ahead of Mary Ann Barrett OP, Janet Brown OP, and Doris Faber OP at the March for Our Lives in downtown Grand Rapids on Saturday, March 24, 2018. Grassroots, non-partisan, student-led organizations planned rallies and marches to protest gun violence in schools on March 24, 2018. Reports indicated that there were March For Our Lives gatherings in Washington DC and 800+ sibling marches across the globe. 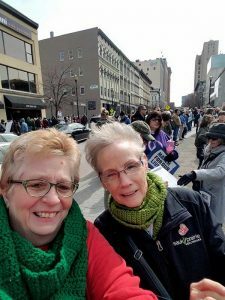 Grand Rapids Dominican Associates Jean McDonald and Mary Hellenbrand support gun control at March for Our Lives Rally in Grand Rapids, Michigan on Saturday, March 24, 2018. 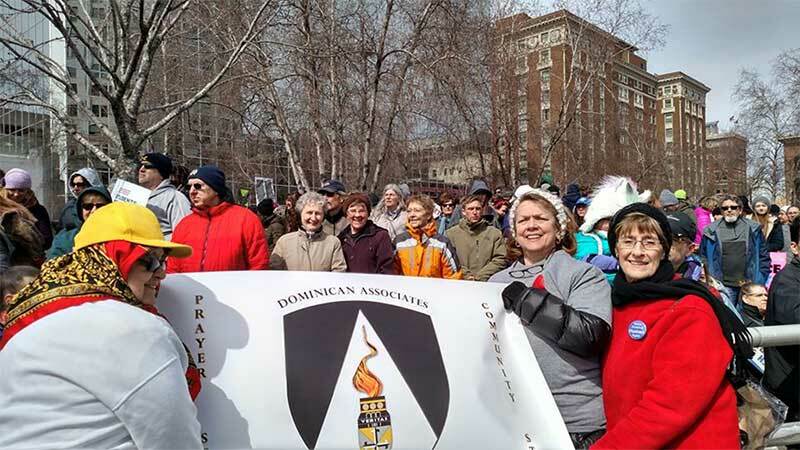 “We thank the 30 plus Sisters, Associates and Sunday Assembly participants who represented the Dominican Sisters ~ Grand Rapids marching in Seattle, Washington, Key West, Florida and downtown Grand Rapids, Michigan,” said Sr. Brigid Clingman, promoter of justice for the Dominican Sisters ~ Grand Rapids.